MIAMI, FL - Couples spend months planning every detail of the day when they finally say “I do” and after a few hours when all their preparations come together, it’s over. The memories and photographs from the big day will last a lifetime… and maybe the flowers can too. Blooms by Heinau creates unique, long-lasting floral centerpieces that look as fresh and stunning after six months as they do the day they arrive. The designers at Blooms by Heinau work directly with the couple to understand their wedding vision and create timeless floral arrangements for the big day. 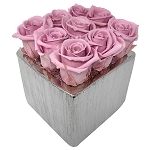 Each order is customized to the couples’ specifications-- from the color of the flowers to the type of container or vase. XO Group Inc., a global media and technology leader and creator of the top wedding website TheKnot.com, released the results of its 2013 Real Weddings Study earlier this year and indicated couples budget around $2,000 on average for wedding flowers. The same website indicates more and more brides plan to preserve their wedding bouquets after the event which can run up to $500 or more. When working with Blooms by Heinau, couples can enjoy a glimpse of their wedding day for months after they say “I do” at an affordable price and without any maintenance. About Blooms by Heinau: Heinau Flowers, an industry leader in providing floral décor to 4 and 5 star accommodations, is located in Miami, Florida. Blooms by Heinau, the direct to consumer division of Heinau Flowers delivers the pure and natural elegance of freshly cut flowers to individuals, celebrities, and corporations at a genuinely affordable price. Our blooms are 100% natural flowers – and will add a beautiful sense of subtle elegance to help color your life. Visit us at www.BloomsByHeinau.com to learn more.